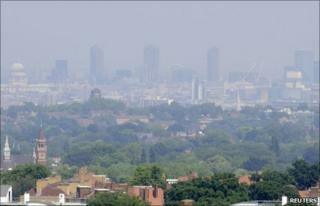 An estimated 4,267 people in London are dying early due to longterm exposure to pollution, a study has found. The study commissioned by Mayor Boris Johnson looked at a ward breakdown of pollution levels and found that central London had the worst air quality. Bryanston and Dorset Square were the most polluted, followed by Marylebone High Street and the City of London. But the study found outer London had the most early deaths linked to pollution due to its higher population. A spokeswoman for the mayor said although the figures were hypothetical, he took the issue "extremely seriously". But Darren Johnson, the Green Party member on the London Assembly, said the report highlighted "the need for urgent targeted measures". The study by the Institute of Occupational Medicine found that Bryanston and Dorset Square had the highest concentration of PM2.5 at at 17.71 mcg per cubic metre. Marylebone High Street came second followed by the City of London, Bloomsbury, West End, St James's, Hyde Park, King's Cross, Holborn and Covent Garden and Brompton. But due to their low number of residents the impact on mortality was comparatively low with only five or six deaths a year. Outer London had the highest number of premature deaths even though pollution levels were much lower there. At least 12 people were likely to die early due to the effects of pollution in Penge and Cator in south London, Cray Valley West in Bromley and Clock House in Beckenham. The mayor's spokeswoman said: "He is investing around £250m a year on sustainable longterm measures to tackle air quality such as a cycling revolution, converting the bus fleet to hybrid, increasing the use of zero-polluting electric vehicles and introducing the New Bus for London, which will be 40% less polluting than a traditional diesel model." However, Darren Johnson said: "It does highlight how inadequate the mayor's plans are to reduce pollution and the need for urgent targeted measures, such as an inner London low emission zone. "There is a real divide between different areas of London, with some areas suffering twice the mortality rate of air pollution related deaths as other areas." This study comes days after the City of London breached the government air quality objectives by recording excessive pollution levels on more than 36 days since the start of 2010.